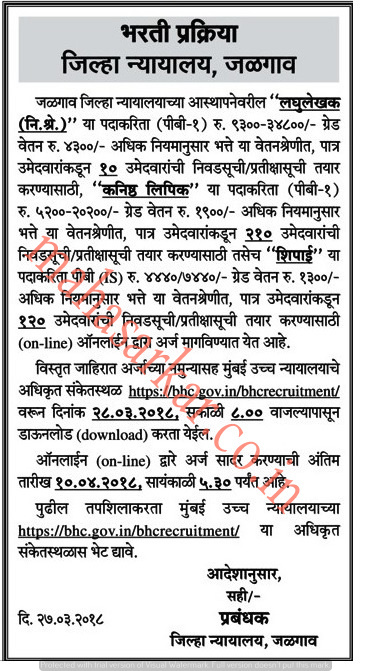 Jalgaon District Court (Jalgaon Zila Nyayalay),Jalgaon Published Job Notification for 340 Lower Division Clerk – Peon & More Posts. Candidates who wish to apply must look at Jalgaon District Court Lower Division Clerk – Peon & More Recruitment 2018. Eligible candidates can apply Online before 10-04-2018. Education Qualification: SSC/7th Pass/ English Typing Speed 40 wpm & Marathi Typing Speed 30 wpm and More. For Post wise Education Details follow the detailed advertisement. Age Limit: 18–38 Years. For Reserved Category 18-43 Years and PWD 18-45 Years. Starting Date, Last Date to Apply Online at Jalgaon Zila Nyayalay which candidates should be remembers as follows.